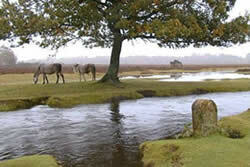 The New Forest became a National Park in 2005, the first for many years and the first ever in South East England. Located between the urban areas of Southampton and Bournemouth it is bounded by the Solent. The National Park is dominated by open expanses of semi-natural vegetation including heathland, bogs, woodlands and streams. This environment is maintained through the grazing of thousands of New Forest ponies and cattle. The New Forest is not actually new and was named "Nova Foresta" the hunting forest of William the Conqueror in 1079. It is not the familiar scene of fields and hedgerows but of a much older, medieval, England with ancient woodland, heathland, beautiful heathers and gorse, bogs and ponds providing stunning views across the countryside. There are 193,00 acres of Forest with about 143 miles of gravel track for walking and cycling. Cars are not permitted on these tracks but there are plenty of free car parks throughout the area. Almost all the tracks are waymarked so navigation is relatively easy. Visitors to the area should find a visit to the New Forest Visitor Museum situated in the car park at Lyndhurst a useful place to familiarise themselves with the Forest. Today many of the old traditions remain. A typical example is the tradition of "comming" where commoners have rights to common. One of these is rights of Pasture where commoners are allowed for a fee to let their animals roam over the New Forest and Villages. When driving through the Forest, many roads have speed restrictions on as ponies, cattle and donkeys have the right away! While visiting the many villages ponies can be seen outside bakers, vegetable shops and even Ice cream shops hoping for a taste. It is however against the law to feed the ponies and you can be fined. There are many attractions to visit in the area so you are never short of something to do if inclement weather postpones walking for a few hours. Like any rural area the Forest changes with seasons. From March to early April you have the young foals and the bluebell woods. In summer you might catch a glance of the deer (there are 5 species of deer in the Forest). In Autumn you have the beautiful coloured leaves and pigs can be seen clearing up the forest floor whilst after a heavy frost in winter the trees take on a magical appearance. If you get tired of walking in woodland you can always visit the town of Lymington, tackle a section of the Solent Way or take a stroll along the beautiful coast line with magnificent views of the Isle of Wight.